Two years ago, a 9-7 Arizona Cardinals team limped into the playoffs, only to make a Cinderella run through the NFC bracket to earn the franchise’s first-ever trip to the Super Bowl. In 2007, a 9-7 wildcard NY Giants team won 3 consecutive road playoff games, then beat the 18-0 Patriots, at the time considered the greatest team of all time, in the Super Bowl to cap a season for the ages. Why can’t the 7-3, 1st place Chicago Bears – equipped with a top-3 caliber defense and special teams – achieve similar heights? If you do any football betting at Belmont.com, I wouldn’t bet against them. After Thursday night’s 16-0 white-washing of the Miami Dolphins, it’s okay to use the words “Bears” and “Super Bowl” in the same sentence…without laughing. Thanks to a stifling performance by their defense, the Bears win in South Beach moved them within a half-game of the best record in the NFC. More importantly, they won their third straight tilt with a familiar recipe of great defense and a running game. It doesn’t take a long look across the NFL landscape and the sportsbook to make a case for the Bears playing in Dallas in early February. Besides the Monsters of the Midway, the wide-open NFC is stacked with contenders that will draw more national attention because of their offensive prowess…which suits the Bears defense just fine. Eagles: Sure, Mike Vick is playing out of his mind right now – his 6 TD performance vs. the Redskins as evidence. But he’s 0-3 against the boys in blue and orange during his career. Should the Bears manage to beat America’s team-of-the-moment in Soldier Field next week, nobody will be laughing at the prospects of Chicago making its 3rd Super Bowl appearance in 25 years. Packers: Like the Bears, the Aaron Rodgers-led Packers are playing their best ball of the season. But the Bears have already beaten GB…and that was before Chicago established its more balanced offensive identity. The season finale vs. the Bears could decide the North, not to mention home field advantage in the NFC playoffs. Giants: The team that manhandled the Bears in week 4 was just beaten down by the previously 1-7 Dallas Cowboys. The Giants started strong last year, only to fall face first into mediocrity by the time December rolled around. Could history be repeating itself in NY this year? This balance at the top of the conference should make for a competitive, wide-open NFC playoff tourney. 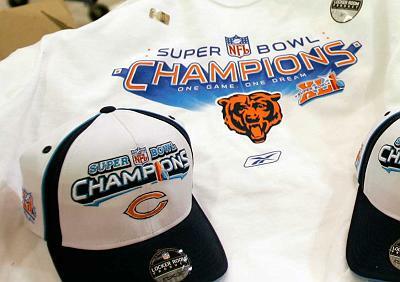 And with a defense and special teams that rank among the best in the league, why can’t the Bears be Super this year? Suddenly, Super Bowl Champion Chicago Bears doesn’t sound so funny anymore, does it? The Bears became the first NFL franchise to win 700 games. The Packers are second on the list with 660 wins. Brian Urlacher unofficially became the all-time leading tackler in Bears history 1,488 stops), passing Samurai Mike Singletary. Brad Maynard moved into 3rd place for the most punts all-time (1,230), trailing only Jeff Feagles (1,713) and Sean Landeta (1,401). Jeff, you have made me a believer! Just got a “Ditka sweater vest” for my birthday -wore it for the first time Thursday night, going to continue to wear it on game days if they win!